Lacy Thread Potholder -- A free Crochet pattern from Julie A Bolduc. 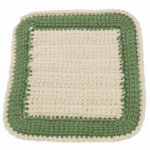 This potholder is first made with a solid inner circle made of 2 pieces that are stitched together. Then 2 more decorative lacy circles are made then all layers are stitched together for form a very thick but flexible potholder.